We are deeply appreciative of the many generous contributions made by a group of area residents and businesses which will allow us to reopen the Library on Friday afternoons through July 1, 2019. Local resident Beth Walker spearheaded this independent fundraising effort. 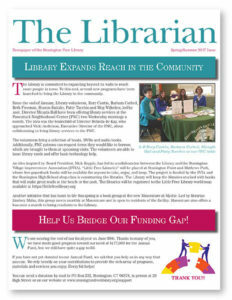 Beth has long been a passionate supporter of the Library and took it upon herself to reach out to her network both to raise awareness of the Library’s current funding challenges and rally her friends, local businesses and the community to show how important the Library is to them and everyone who lives in Stonington. Beth was previously a longtime year-round resident and now lives here in the summers. When she returned to Stonington this summer, she was horrified that the Library, a cultural hub which serves so many needs of all those in the community, had to reduce its hours because of budget constraints. As someone who has worked in the book business and loved books all her life, Beth didn’t want to see the Library hours cut, and so decided to take on the task of raising enough money to reopen it. Many residents and businesses, most of whom already support the Library throughout the year, stepped up to the plate in this emergency situation, to give extra dollars to keep the Library open full-time. The original cut in Friday hours was part of a larger effort to reduce Library operating costs in response to budget constraints. As the Board pursues strategic avenues to provide a permanent path to sustainability, which will include working with the Board of Finance’s new Task Force examining future Library funding, we are delighted that this one-time act of generosity will provide an immediate stopgap, allowing the Library to restore hours of community access. Over and above the monetary contribution, we enormously appreciate this demonstration of the community’s commitment to the long term viability of the Library and its value to our Town.